Margin squeeze ahead. U.S. farmers are expected to switch significantly more acres back from corn to soybeans to cut down on costs, the U.S. Department of Agriculture said this week. 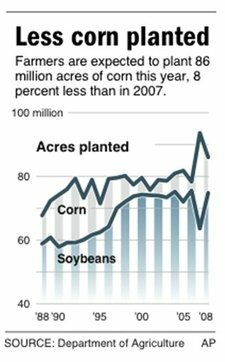 According to the latest Prospective Plantings Report, farmers intend to seed about 86 million acres of corn this year, down 8% from 2007, largely because the stuff takes so much fertilizer to produce. Some analysts are already nervous, including BB&T Capital Markets' Heather Jones, who said Monday that if indeed the USDA's call on corn acreage is right, either "demand must be rationed or there needs to be a big supply response from other growing regions of the world." Less informed observers are also weighing in. Biodiesel producer, take heart! In contrast, the USDA's forecast for U.S. soybean planting this year is way up at 74.8 million acres (versus 63.6 million acres that farmers planted in 2007.) That's because soybean prices have shot up in recent months, making the crop more profitable in relation to corn even though soybeans produce far less per acre. Soybean prices, according to ag economists, generally need to be at about 2.5 times higher than the price of corn to equalize the revenue between the commodities. Why not try Palm Oil? In Malaysia, palm oil is used to make biodiesel and this is becoming more infeasible economiccally now with the price of palm oil at RM$3500.